PRESERVE: Volunteers dry and glue plant samples to archival paper. San Luis Obispo County has more plant species than the entire state of Alaska. So naturally, keeping track of all this flora requires a lot of work. Cal Poly’s Hoover Herbarium catalogs plant life from all over SLO County and beyond. 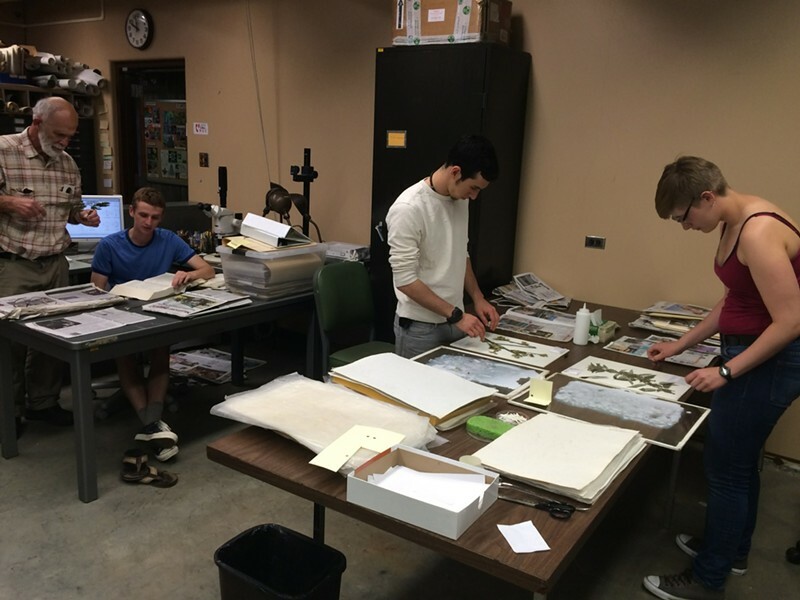 Recently, it has implemented a volunteer program that allows anyone to get involved with the herbarium’s work. “In the simplest terms, I call it arts and crafts for botanists,” said Dr. Jenn Yost, a professor of botany at Cal Poly and the incoming director for the herbarium. Volunteers preserve and catalog plants given to the herbarium by botanists. Donated plants have to be flattened, dried, and glued to archival paper. Volunteers also label and catalog the plants. The location and date of a plant discovery are “vastly important,” Yost said. This information allows researchers to track how climate change is effecting where species grow. Date and location also allow researchers to see when invasive species first appeared in an area, and when a species went extinct, among other things. Yost said the atmosphere in the volunteer sessions is social—“kind of like a knitting circle.” Much of the work is with the hands, so volunteers are able to talk and share stories. However, some of the work requires meticulous attention to detail. “A retired librarian is the perfect person for this kind of work,” Yost said. Volunteers also add plants to the herbarium’s database. Pairing GPS reference data with plant specimens allows the herbarium to create maps that show where plant species are occurring. Information about the kind of climate a plant grows in can be gleaned from these maps. The maps allow researchers to make predictions about where plants may be growing in 10 or 20 years, Yost said. Maps can help decision makers learn where limited resources for conservation will have the most benefit. Yost described a former Cal Poly student, Kristie Haydu, who completed a master’s project that mapped the distribution of every rare plant in the county. The map showed where the most biodiverse areas are located. The herbarium got its start from the collection of Dr. Robert F. Hoover, a Cal Poly professor who made extensive collections of local plants from the 1940s through the 1960s, during a time when Cal Poly did little to encourage research. Hoover wrote a book, Vascular Plants of San Luis Obispo County, California, which documented the area. Hoover’s collections were formally dedicated in 1969. Some samples are even older than Hoover’s collections, and their age brings with it special challenges. Yost gave an example of a sample that referenced an “Andrew’s Ranch.” A volunteer had to determine where the ranch was in 1880 to make an accurate geographic reference. Herbariums are crucial when it comes to discovering new species, Yost said. Contrary to popular imagination, a botanist doesn’t go out on a hike, see a new species, and identify it on the spot. Plants are collected, taken back to the herbarium for preservation, and later discovered to be new species by experts. On average, a new species will sit in a herbarium for 50 years before being discovered. Herbariums also act as repositories of DNA. DNA can be extracted from any of the herbariums samples, even if they are a hundred years old. This allows researchers to see if the plant population has changed over time. DNA has also led to a more precise understanding of some species. Looking at DNA has caused some plants to be renamed, when their genetics revealed them to be more closely related to another species. The volunteer program will continue indefinitely, but hours will likely change with Cal Poly’s quarter schedule. Currently volunteer sessions are held Monday and Tuesday mornings from 9 a.m. to noon. Experience isn’t necessary, and there is no commitment to come each week. The herbarium is in the Fisher Science Building at Cal Poly in rooms 352 and 358. Those who wish to get involved should email Yost at jyost@calpoly.edu. Patrick Contreras, an electric rock violinist, will play at Otter Rock Café in Morro Bay on Saturday, Aug. 9, from 8 to 11 p.m. The performance, dubbed Jive in the Jungle: Leo Celebration, is presented by Festival After Dark and Otter Rock Café. Event proceeds benefit the Paso Robles Youth Arts Foundation. Guests are encouraged to wear jungle-themed costumes. This week’s Strokes & Plugs was watered daily by intern Kyle McCarty. Send nonprofit and business news to strokes@newtimesslo.com.